The real estate blog Motovo has revealed that while Link was living in a tree, Zelda was born into the lap of luxury. Buying real world versions of fictional objects tends not to be the hardest thing to do. For instance, with the internet as your marketplace replicas of gear from The Legend of Zelda are fairly easy to track down. That said, while a simple Google search might be enough to find you affordable versions of the Master Sword and the Hylian Shield, there are some things from the classic franchise that you'd be hard pressed to make your own. Hyrule Castle, for instance, is probably out of the common consumer's reach. 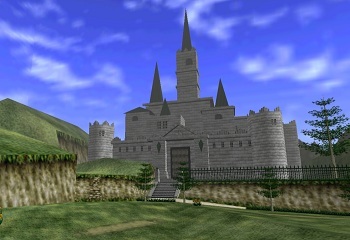 To prove that fact, the real estate blog Motovo recently looked at the Ocarina of Time version of Hyrule Castle and used the "Song of Math" to calculate its real world value. Motovo determined the castle to be about 82,950 square feet in size. Tuscany, Italy was then chosen as the Earth-location most similar to Hyrule. Using the price of an ancient castle in that part of the world ($1372/sq. ft.), Motovo ran the numbers and came up with a whopping price tag of $113,807,400, making it one of the most expensive fantasy castles the blog has looked at. Being the rulers of the land and all, we figured Zelda's family was on the richer end of the spectrum. Even so, that's a lot of Rupees no matter how you slice it. It also kind of adds some sting to the first time you meet Zelda in Ocarina of Time, and all she gives you is a letter with her autograph. Considering that she's tasked you with charging off into inconceivable danger, it wouldn't seem like a bit of financial support would have been too much to ask for.